Many of Switzlerland's immigration detention practices contrast sharply with those of its neighbours. For instance, when compared to detention centres elsewhere in Europe, some Swiss detention sites—like its Frambois facility, located just outside Geneva—have decidedly good reputations for their humane conditions. On the other hand, some Swiss detention practices and policies are more restrictive, including its laws providing for the detention of minors and the routine imposition of criminal sanctions for violations of the federal law on foreigners. From its 2005 adoption of a controversial asylum law—“one of the strictest pieces of legislation in Europe,” according to the UN High Commissioner for Refugees (UNHCR)—to its 2009 referendum banning the construction of minarets, Switzerland’s reaction to immigration has become increasingly antagonistic in recent years. Bolstered in part by the growth of anti-immigrant political parties, Swiss policies and practices are nevertheless driven by a set of unique and sometimes contradictory political and historical forces, including hosting one of the highest foreign-born populations in the world, serving as home to many of the United Nation’s core human rights bodies, and having one of Europe’s more complex political, linguistic, and cultural profiles. Swiss detention and deportation policies have been duly impacted by these competing forces. For instance, because Switzerland delegates immigration powers to the cantons, regional authorities have broad discretion in how they apply the 2005 Federal Law on Foreigners, which can result in varying degrees of enforcement from one canton to the next. This situation presents significant challenges for researchers investigating Swiss immigration detention practices. When the Global Detention Project (GDP) asked the Federal Office for Migration about the country’s immigration detention centres, we were informed that our requests had to be sent to each individual canton—this despite the fact that some key responsibilities, like helping fund the construction of detention facilities and assisting the deportation of detainees, can involve federal agencies. Further, some Swiss cantons failed to respond to repeated requests for information about the locations and numbers of immigration detainees, raising questions about public access to current information. However, as a result of a lengthy investigation researching available official and non-official sources of information, consulting studies undertaken by colleagues at various Swiss universities, and querying non-governmental actors assisting detainees, the GDP was able to piece together what appears to be a first-of-its-kind profile of the Swiss immigration detention estate. We found that unlike some of its neighbours—who strictly use dedicated, purpose-built facilities—Switzerland makes use of a broad array of facilities for medium- to long-term immigration-related detention. It operates detention facilities in airports, detains people slated for deportation in prisons, has several dedicated immigration detention centres, and houses asylum seekers in facilities that have been characterized as “semi-carceral” by rights groups. In addition, foreign nationals convicted of status-related violations can be incarcerated in prisons to serve their sentences. When compared to detention facilities elsewhere in Europe, some Swiss detention sites—like its Frambois facility, located just outside Geneva—have decidedly good reputations for being well kept and treating inmates humanely. On the other hand, many Swiss detention practices and policies have been heavily criticized. These include imposing detention regimes on administrative detainees that can be more punitive than those for criminal detainees; the excessive use of force during deportation proceedings, which has led to several deaths in the past decade; the routine imposition of criminal sanctions for violations of the federal law on foreigners; and denying residence permits to non-deportable foreign nationals, leaving them vulnerable to repeated stays in detention. According to Wickers (2010), the concept of “illegal” foreigners first emerged in Switzerland in the 1970s as refugees from non-European countries gradually replaced “guest workers” as the dominant image in Swiss discourse about immigration. He writes: “It is no coincidence that public concern over ‘illegal’ migrants is associated not with the image of the Gastarbeiter but with that of the refugee or asylum seeker … [who] were generally of non-European origins” (Wickers 2010, p. 224). The concept of immigration-related detention, however, emerged much earlier than that of “illegality.” Switzerland’s first foreigners law, the 1931 Foreign Nationals Act, introduced “internment” of foreign nationals, providing authorities with the power to detain non-citizens for up to two years in cases where deportation orders could not be carried out (Zünd 2007, cited in Achermann and de Senarclens 2011). By 2008, the date when Switzerland’s current immigration legislation—the 2005 Federal Law on Foreigners (Loi fédérale sur les étrangers)—came into force, Swiss law included an assortment of detention-related enforcement provisions covering a board range of grounds and varying lengths of detention. In 2011, with the adoption of the EU Returns Directive, the maximum duration of detention was shortened from two years to 18 months. Charged with coordinating the implementation of Swiss immigration policies is the Swiss Federal Office for Migration (FOM), which was formed in 2005 when the previously separate Federal Office for Refugees (FOR) was merged with the Federal Office of Immigration, Integration and Emigration (IMES). Among its responsibilities are managing adjudication of asylum claims and overseeing deportations, including the controversial “vols speciaux”—or “special flights”—that are arranged in cases of coercive expulsions from the country. In addition, the FOM is responsible for the detention of asylum seekers in transit zones as well as for their accommodation during their procedures. This varying implementation of detention measures can lead to some unusual outcomes. For instance, the Frambois detention centre near Geneva is governed by an agreement (concordat) between the cantons of Geneva, Vaud, and Neuchâtel, each of which send immigration detainees to Frambois based on their own enforcement decisions (CLDJP, “Etablissement concordataire de détention administrative LMC de Frambois, à Vernier, dans le canton de Genève”). As a result, detainees at Frambois from one canton may be detained on grounds that another canton might not rigorously apply in the same circumstances. Additionally, in a facility like Frambois, there is not a single custodial authority for all the immigration detainees. Rather, there are potentially four separate authorities who can have persons in their custody detained at the facility: the federal government and the three cantons that are part of the concordat (CLDJP, “Le contexte du concordat LMC”). “Coercive Measures.” “Temporary detention” (Article 73, Law on Foreigners) grants “competent authorities” at both the federal and cantonal levels the power to detain foreign nationals for up to three days if they fail to produce a valid residency permit in order to determine their residency status and/or establish their identity and nationality. The law does not specify where these people can be detained. People held on these grounds must be informed of the reasons for their detention and can request a judicial authority to confirm the legality of their detention. This initial detention period is not counted towards the overall maximum period a foreign national can be detained based on an expulsion or deportation order or on grounds of insubordination. “Detention in preparation for departure” (Article 75), which empowers cantonal authorities only, provides for “preparatory detention” (retention en phase préparatoire) of foreign nationals not in possession of a valid residency permit while a decision is being made on their right to remain in Switzerland in order to guarantee their deportation. Detention of foreign nationals in this situation is not mandatory and can be applied to foreign nationals who, inter alia: refuse to identify themselves during asylum procedures; apply for asylum under multiple identities; do not present themselves to authorities when required to do so, according to asylum procedures; leave their designated area of residence or enter a prohibited area; have been issued a removal order on the basis of grounds provided in the Asylum Act; make a prohibited entry into Switzerland; apply for asylum after being expelled or after an expulsion order has been carried out on certain grounds; file an asylum claim in order to prevent the execution of a removal or deportation order; constitute a serious threat or danger to others; are the subject of criminal proceedings or have been convicted of certain crimes. “Detention pending deportation” (Article 76) grants unspecified “competent authorities” the authority to detain a person in order to ensure enforcement of immigration decisions when “the court of first instance has issued an expulsion or removal order.” Detention on these grounds is not mandatory, and can be applied to foreign nationals if they, inter alia: have already been detained under Article 75; leave their designated area of residence or enter a prohibited area as specified in Article 74; have been ordered removed on the basis of grounds provided in the Asylum Act; cross a border into Switzerland, in spite of being prohibited from doing so; constitute a serious threat or danger to others; are the subject of criminal proceedings or have been criminally convicted of certain crimes. Additionally, under this article, foreign nationals can be detained if there is concrete evidence to suggest that they will evade the execution of an expulsion or deportation order or refuse to cooperate with authorities for the execution of the order. Lastly, “coercive detention” (détention pour insoumission) (Article 78) grants authority to the canton that issued a deportation or expulsion order to detain foreign nationals who fail to leave Switzerland within the specified time period or who obstruct the deportation process (insubordination). “This measure allows detaining foreigners who cannot be deported unless they agree to cooperate and aims at forcing them to do so” (Achermann and de Senarclens 2011). Detention on these grounds can be ordered for a period of one month, and can be extended every two months for an additional two months, with the consent of the cantonal court. detentions pending deportation; 5 percent were coercive detentions; and 2 percent were detentions in preparation for departure. Additionally, they report that 86 percent of people detained pending deportation were successfully deported in 2008; 74 percent of detainees in preparation for departure were deported; and only 26 percent of those in coercive detention were deported. More recently, in 2011, the Federal Department of Justice and Police published statistics showing that between January 2008 and June 2010 a total of 7,136 detention orders were issued to foreign nationals based on their status. Of these, 6,804 (95 percent) were related to detention pending deportation or expulsion and 132 were cases of “preparatory detention”; 200 were coercive detention orders (DFJP 2011, p. 24-25). The average length of detention pending removal or deportation during this period was 24 days. The average length of coercive detention was 155 days; and 31 days for preparatory detention (DFJP 2011, Annexe 4). Expulsion, removal, deportation. A deportation order can be issued to a foreign national deemed ineligible to be in Switzerland; whose request for authorisation to stay has been refused or revoked; whose authorisation to stay has expired and no request for renewal has been made; who, holding a valid residency permit of another Schengen member state, is requested by that state to return (Art. 64). Separate grounds for deportation orders related to the Dublin accords are contained in Article 64(b). Foreign nationals can be issued an expulsion order if they threaten the internal and external security of Switzerland. They are subsequently prohibited from re-entering the country for a specified period (Art. 68). Cantonal authorities are responsible for executing deportation and expulsion orders in cases where a foreign national has not left the country within the specified deadline for departure; if deportation or expulsion orders are to be carried out immediately; or if foreign nationals are detained under articles 76 or 77 (Art. 69). In November 2010, Switzerland voted in a national referendum to adopt a policy of mandatory deportation of foreign nationals convicted of certain crimes, such as murder and benefit fraud, following the completion of their prison sentence. The rightwing Swiss People’s Party (Union démocratique du centre, or UDC) proposed the constitutional amendment based on what it viewed as a disproportionate number of foreign nationals populating Swiss prisons—more than 60 percent as of October 2010. The new law, which as of September 2011 had not yet been elaborated, will apply to all noncitizens, including the Swiss-born offspring of noncitizen immigrants who have lived their entire lives in Switzerland. Some observers have argued that the referendum was a tactic by conservative political factions in Switzerland to harness a backlash in the country against its burgeoning foreign-born population, which according to the Organization for Economic Cooperation and Development (OECD) had, by 2007, reached nearly 25 percent, among the highest in the developed world (OECD 2010). Said Swiss political analyst Georg Lutz at the time of the referendum, “What most people will want to do in this vote is make a statement against foreigners and that is the central motivation” (BBC News 2010). Among the concerns voiced by observers about the new law are whether it could violate Swiss-EU accords on the free movement of people because it would not exempt European nationals, respects the principle of proportionality, and could violate the principle of non-refoulement (Achermann 2011). Before the vote, the Swiss government had urged voters to reject the proposal, suggesting an alternative system that would permit deportation for certain crimes based on an individual assessment of each case (BBC News 2010). The Federal Law on Foreigners provides that expulsion and deportation procedures must be carried out “without delay” (Art. 76.4). The Federal Department of Justice and Police can be called upon to assist in deportation and expulsion of foreign nationals from the country, including in order to obtain travel documents; organize the return journey; and coordinate between cantons and the Federal Department of Foreign Affairs (Art. 71). Observers have criticized Swiss authorities for the use of excessive force during the deportation process, which has led to multiple deaths, including most recently the death of a Nigerian national (Joseph Ndukaku Chiakwa) in 2010. This has been a long-standing problem in the country. In 2001, Amnesty International (AI) sent a letter of concern to the authorities in canton Valais following the death of a Nigerian asylum seeker who died within one hour of the commencement of his deportation procedure. AI said, “In view of the deaths which have occurred in recent years following the use of dangerous methods of restraint during forcible deportation operations, and in view of persistent allegations of use of excessive force by police officers acting as escorts during deportation operations from Switzerland, Amnesty International believes that it is essential for all cantonal governments to review police restraint techniques and the relevant guidelines and training for police and medical personnel involved in deportation operations in their cantons” (Amnesty International 2001, p.3). In 2008 the Swiss NGO Coalition for the Universal Periodic Review (UPR) criticized Swiss policies for allowing “the use of electro-shock instruments” and for failing “to make any provision for the independent monitors to be present during the deportation” (Swiss NGO coalition for the UPR, p.3). Schengen countries are required to operate special flights for forced deportations with “neutral observers” on board. On 15 June 2011 the Federal Office for Migration announced that the Fédération des Eglises Protestantes de Suisse would be charged with this task, for an initial pilot project period of six months. The organisation is to be responsible for ensuring that deportation processes respect the law and are “appropriate” (Swiss Confederation News 2011). Despite this arrangement, in July 2011, when Switzerland undertook its first vol special since the death of Joseph Ndukaku Chiakwa in 2010, there were no independent observers present. This fact was later highlighted by observers when a news channel released footage showing one of the deportees being beaten by a police agent (Haltiner 2011). Length of detention. The maximum period foreign nationals can be detained in preparatory detention, that is while a decision is being made on their right to remain in the country, is six months (Art. 75). Foreign nationals being detained pending the execution of a deportation or expulsion order (Art. 76) or for insubordination (Art. 78) can be detained for up to six months, with the possibility of an additional twelve months (for adults), and six months (for minors aged between 15 and 18 years), if the person concerned refuses to cooperate with authorities or where more time is required to obtain the necessary travel documents (Art. 79). Cantonal courts are required to agree to any extension of detention beyond six months (Art. 79). The total maximum length of detention for adult foreign nationals is 18 months (547 days) (DFJP 2011, Annexe 4). The Federal Department of Justice and Police reported that between January 2008 and June 2010, the maximum period a person was detained in “preparatory detention” was 273 days. During that same period, the maximum length any one person was detained pending deportation, expulsion, or on grounds of insubordination was 547 days (DFJP 2011, Annexe 4). When expulsion or deportation are not possible, the Foreigners Law allows for the provisional release of a foreign national (Art. 83). Observers have noted that people who cannot be deported are often released just before they have reached the maximum length of detention. However, they are not issued a residence permit, leaving them vulnerable to police checks, criminal sanctions for irregular stay in the country, and re-detention (Zopfi 2011; Kakpo 2011). Algerian nationals are particularly susceptible to this treatment as Algerian authorities refuse to sign readmission papers for their nationals detained in Switzerland (Kakpo 2011). Procedural guarantees and minimum standards. The first order of detention must be reviewed within 96 hours by a judicial authority. Foreign nationals can request the review of any extensions of their detention by a judicial authority (Article 80). Conditions of detention and procedural guarantees are provided in Article 81 and include, inter alia, the right to correspond with a representative, family members, and consular authorities; segregation from criminal detainees; detention in “suitable premises”; and the provision of special needs for vulnerable persons, including unaccompanied minors and families with children. Minimum prison conditions are provided in the European Parliament Directive 2008/115/EC on standards and procedures in Member States for returning illegally staying third-country nationals. Detention can be suspended if, inter alia, the foreign national cooperates with authorities and if their voluntary departure from Switzerland is impossible; if departure takes place in a timely manner; or if a request for a waiver of detention is filed and approved (Art. 79). Criminalisation. Switzerland appears to be one of the few European countries—along with Italy—to routinely impose criminal sanctions (including imprisonment and fines) for status-related violations, which are provided in Article 115 of the Foreigners Law. According to a Zurich-based advocacy group Gruppe augenauf, Switzerland’s short-term, low-security prisons often hold numerous immigrants who are completing prison sentences for illegally residing in the country (Zopfi 2011b). In 2009, there were 12,537 convictions for violations of the Federal Law on Foreigners. However, the Swiss Statistical Office does not provide a breakdown of the statutes in the foreigners law that were the bases for these convictions, thereby making it impossible to know which ones were status related (Ducommun 2011). According to Gruppe augenauf, both rejected asylum seekers and migrants apprehended for the first time on grounds of irregular entry, stay, or exit are ordered to leave the country within a specified time period. If they fail to leave the country within that time period and are reapprehended, they are typically given a suspended three-month prison sentence and issued an order to leave the country in most cantons. If the migrant fails to leave the country within the specified time period and is apprehended again, the person can be sentenced to an additional three-month sentence and can also be ordered to serve the initial three-month suspended sentence (Zopfi 2011). After a migrant has served a prison sentence for violating the Foreigners Law they are sometimes moved to administrative detention pending their removal from the country. This remains at the discretion of the cantonal offices and is influenced by the ease with which travel documents and deportation can be arranged (Zopfi 2011c). Foreign nationals can also incur prison sentences and fines for, inter alia, the provision of false information to authorities and if the foreign national leaves an assigned place of residence or enters a prohibited area of the country (Arts. 118-119). As with all penal affairs in Switzerland, prosecution and trial for these offences fall under the jurisdiction of the cantons. Where multiple offences occur across different cantons, the canton in which the first offence occurred is responsible for prosecution and trial (Art. 120d). Minors. According to Article 79 of the Foreigners Law, minors aged 15 to 18 years can be detained for up to six months if they refuse to cooperate with the authorities during deportation proceedings. Article 81, which details certain conditions of detention, stipulates that the form of detention must take into consideration the needs of vulnerable persons, such as unaccompanied minors and families with children. In practice, certain facilities, such as Frambois, do not generally confine minors (Varesano 2011). According to Gruppe augenauf, there have been cases were infants were placed in administrative detention with their mothers (Zopfi 2011c). Asylum seekers. As stated earlier, Swiss law provides for the detention of asylum seekers. According to the Asylum Law, if an asylum request is made at a Swiss airport, the asylum seeker can be detained at the airport, or in exceptional cases in another “appropriate” place, for up to 60 days (Art. 22). If an asylum seeker is given an order of deportation, he/she can be detained in a detention centre in order to facilitate the expulsion (Art. 22). Asylum seekers who request asylum at the airport should be notified of the decision of their request within 20 days of their having submitted the request. If the procedure extends beyond this 20 days, the office for migration can assign the asylum seeker to a canton (Art. 23). Additionally, the Law on Foreigners provides for detention measures in cases were asylum requests are rejected; if asylum seekers refuse to cooperate with authorities; if their application is considered to be abusive; if they have committed a criminal offence; or if there is evidence to suggest that they will refuse to comply with being returned to their home country (Articles 73-81 of the Federal Law for Foreigners; Swiss Refugee Council 2010, p. 6). According to the Law on Foreigners, detention cannot exceed 30 days when a removal decision based on articles 32-35a of the Asylum Law is issued in a reception centre, or when “the decision to remove the person concerned on the basis of Article 34 paragraph 2 letter d AsylA or Article 64a paragraph 1 is issued in the Canton and the enforcement of the removal is imminent” (Art 76.2). Non-governmental observers report that asylum seekers are generally only taken in to custody in Switzerland in the initial stages of the asylum-seeking process for the purposes of first instance determination of eligibility to enter the asylum process, as well as to undertake identity and health checks. Switzerland is a party to the 1951 Refugee Convention. Although the country is not part of the European Union, it is party to the European Union Dublin regulation, the system that determines which European country is responsible for treating asylum applications. The Swiss Asylum Law (Loi sur l’asile 1998), which has been amended several times, contains varying provisions for how and if the Federal Office for Migration processes asylum seekers, which are based in part on where asylum requests are made—for example, at a Swiss border, within a Swiss airport, or after a person has already entered Swiss territory. When they are not detained at border transit facilities in the Geneva or Zurich airports—or after being released from a initial detention measure—foreign nationals who apply for asylum upon arrival in the country are taken to one of five semi-secure reception centres (centres d’enregistrement et de procédure) for the purposes of identification, health checks, and first instance determination of eligibility. According to a legal order on asylum procedures (Ordonnance 1 sur l’asile relative à la procédure), people are not to remain at these facilities for more than 90 days. One observer told the Global Detention Project that asylum seekers generally do not stay for more than two weeks at reception centres (Zopfi 2011b). In contrast, a representative of the group Service d’Aide Juridique aux Exilé-e-s (SAJE), which works with asylum seekers at the Vallorbe reception center in Vaud, said that people remain at that facility for an average of 40 days (Bregnard Ecoffey 2011). After they are discharged from a reception centre, asylum seekers are sent to a particular canton and typically provided non-secure accommodation for the duration of their status determination process (Zopfi 2011b; Swiss Refugee Council et al. 2010, p.1). The Federal Office for Migration, which is part of the Department of Justice and Police, is responsible for asylum procedures in Switzerland. The office provides a visual description of the asylum process on its website. The non-governmental Swiss Refugee Council also provides a step-by-step outline of the National Asylum Procedure, including information on the rights of asylum applicants, procedural guarantees, and implementation of the Dublin II regulation. In March 2011, the Department of Justice and Police presented a report on measures for accelerating the asylum process (“Rapport sur des mesures d’accélération dans le domaine de l’asile”). The report concluded that a key problem with the Swiss asylum process is the excessive amount of time it takes to conclude an individual asylum claim (DFJP 2011, p.5). The report presented several options for accelerating the process, one of which, if implemented, would increase the maximum duration of stay in semi-secure asylum registrations centres (DFJP 2011, p.6). Switzerland introduced a number of controversial changes to its asylum procedures in the 2006 Asylum Law, some of which increase the chances an asylum seeker can be detained. According to the Swiss NGO coalition for the UPR, the law violates the 1951 Refugee Convention in its provision denying people access to asylum procedures if they fail to produce valid travel and identification documents within 48 hours of arrival (Swiss NGO coalition for the UPR 2008, p.3). UNHCR described the law as “one of the strictest pieces of legislation in Europe,” raising concerns that asylum seekers who fail to provide valid travel documents and identity cards—which is not uncommon for people fleeing war or persecution—will in principle not have a substantive examination of their claim unless it is already clear that they are refugees (UNHCR 2005). In addition to these concerns, Human Rights Watch (HRW) pointed to the limited window of opportunity asylum seekers have for appealing asylum decisions and the contact Swiss authorities have with third-country governments. HRW claims that contact with third-country governments could undermine the asylum procedure because of the risk that information about the asylum claimant would be discovered by the home government (HRW 2006). Obtaining comprehensive information about Switzerland’s migration-related detention estate is challenging because it is managed at the cantonal level. When the Global Detention Project sent a request to the Federal Office for Migration (FOM) for a list of facilities used for immigration detention, the FOM responded, “Unfortunately, we're are [sic] not in possession of such data as the cantons are responsible for the detention of migrants awaiting deportation. For further information and data, please contact the cantonal immigration authorities” (Avet 2011). Thus, to construct verifiable information about the Swiss immigration detention infrastructure, GDP researchers undertook a two-step investigation: (1) we sent repeated requests for information to relevant cantonal authorities, a majority of whom responded promptly and comprehensively; and (2) while awaiting responses from cantonal authorities, we culled partial and/or out of date information from a number of official and non-governmental sources. One source of information used by GDP researchers was the Federal Department of Justice and Police (DFJP), which provides a breakdown of the number of places of detention reserved for migrants awaiting deportation in each canton in its 2011 Rapport sur des mesures d’accélération dans le domaine de l’asile. The DFJP reports that there are a total of 476 places set aside for the administrative detention of migrants in Switzerland, including in prisons and dedicated deportation facilities (DFJP 2011, p. 25). However, it does not list the actual facilities each canton uses. Other sources included: the website of the Swiss Statistical Office; interviews with nongovernmental organizations working in different Swiss cantons (including Gruppe augenauf, Service d’Aide Juridique aux Exilé-e-s, and the Geneva-based Ligue suisse des droits de l'Homme); and consultations with Swiss academic researchers (including at the University of Geneva and the University of Neuchâtel). The Swiss Federal Statistical Office website provides information on each prison and place of detention in Switzerland, including the legal grounds on which inmates can be held at each facility, including for violations of the Federal Law on Foreigners (in particular, Articles 73 and 75-78, which pertain to status-related administrative detention). However, at the time of this publication, in October 2011, the information on this website had last been updated in 2008. After culling information from these various sources we then compared it to the information provided by cantonal authorities, the details of which are described below. 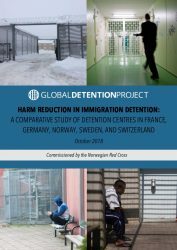 Based on this exhaustive investigation, the Global Detention Project was able to develop a comprehensive and up-to-date profile on the Swiss immigration detention complex, which appears to be a first-of-its-kind snapshot of this phenomenon in Switzerland. This list of 32 faculties, which is available here, includes only those facilities that provide for administrative immigration detention, in addition to any criminal incarceration role they may have. However, as one Swiss non-governmental expert pointed out, one could potentially include the majority of Switzerland’s short-term prisons on the country’s list of immigration-related detention sites because they can be used to incarcerate migrants serving penal sentences for convictions on status-related immigration violations (Zopfi 2011b). What facilities does the canton use to detain people for migration-related reasons? What was the total number of persons detained by the canton for immigration-related reasons during 2009 and 2010? These letters were sent during the months of June, July, and August 2011. As of September 2011, the GDP had received complete responses from only 18 cantons. One canton stated that it would not provide any information (Nidwalden); one canton requested that the information it provided about the numbers of detainees remain confidential (Solothurn); two cantons only provided partial responses (Ticino and Vaud); three cantons neglected to respond to any of our requests (Bern, Valais, and Grisons); and one canton, Jura, requested that additional information be sent by regular mail before responding. This information was sent in mid-July 2011. As of October 2011, the GDP had still not received a response from Jura authorities. As we harvested the information we received from the cantons, we noticed a number of additional peculiarities with respect to Swiss detention practices. For instance, while most cantons operate either a dedicated migrant detention facility or a prison with a separate section for migrants, some do not, including Ticino, Uri, and Vaud. Some of these cantons have agreements with neighbouring cantons that permit them to send migrants awaiting deportation to the facilities in these neighbouring cantons. The canton of Ticino, for example, sends migrant detainees to a prison in Grisons. Others, like Geneva, Fribourg, and Neuchâtel, have entered joint agreements (or “concordats”) on the use and administration of shared facilities. Similarly, Appenzell-Innerrhoden detains migrants based on their status at the Appenzell-Innerrhoden Cantonal Police Prison for up to 72 hours. Migrants detained beyond 72 hours are sent to the Altstatten Regional Prison in St. Gallen. The information provided by the cantons also reveals some important detention trends. For instance, according to the information we received, by far the most active detaining canton during the 2009-2010 period was Basel-Stadt, which reported 916 detentions in 2009 and 831 in 2010. Basel-Stadt was followed by Zurich (473 and 477, respectively), St. Gallen (217 and 256) and, effectively tied for third place, Geneva (143 and 123) and Fribourg (144 and 115). It is important to note that Bern, as one of the most populous cantons in Switzerland, is likely also one of the most important detaining cantons. However, as noted above, it failed to respond to our requests for information. The following table (Chart I) presents the information provided by each canton, including details on the facilities they use to detain migrants and the number of persons detained for immigration and/or asylum related reasons during 2009 and 2010. It is important to note that the list of facilities provided in this chart below is different from the overall list of 32 facilities discussed above as it includes only the information we received from the cantons and not what we were able to cull from other sources. Dedicated immigration detention facilities and prisons with special sections for migrants awaiting deportation. According to information obtained by the Global Detention Project, most of Switzerland’s 26 cantons operate either a dedicated immigration detention facility or a prison that has a separate section for migration-related detention. Some cantons share a single facility, like the Frambois facility in Geneva, which is used by the cantons of Vaud, Neuchâtel, and Geneva. Widnau Deportation Prison (Gefängnis Widnau), St. Gallen. Zurich Airport Prison (Flughafengefängnis Abt. Ausschaffungshaft). The federal government pays a daily contribution to cantonal offices for the operation and implementation of immigration detention measures, including for asylum seekers and other foreign nationals whose detention is related to the revocation of a measure of provisional admission (Art. 82). Management of these detention facilities is the responsibility of cantonal authorities, usually the canton’s Service for Population and Migration. Custodial authority of immigration detainees—that is, the official body that has final determination over the status of the person—also falls under the responsibility of the cantons, although there can be exceptional cases in which the effective custodial body is the Federal Office for Migration when it issues removal orders. The Swiss Federal Office for Migration lists all cantonal authorities responsible for immigration on its website. Because some facilities are used by more than one canton, there is often more than one custodial authority in operation at a centre—for example, in the case of Geneva’s Frambois facility, which is operated under a concordat between Geneva, Neuchâtel, and Vaud (CLDJP, “Le contexte du concordat LMC”). The cantons of Uri and Nidwald have also established a formal concordat whereby Uri sends its immigration detainees to Nidwald (DFJP 2011, Annexe 5). Additionally, Basel-Stadt reserves 18 places for irregular migrants apprehended in Basel-Landschaft (DFJP 2011, Annexe 5). Limited space in some facilities appears to prompt some cantons to use multiple facilities for holding their immigration detainees. For example, cantonal authorities in Neuchâtel informed the Global Detention Project that in addition to sending irregular migrants to Frambois, they also occasionally send foreign nationals to other penitentiary establishments, including the Witzwil establishment, Berne Regional Prison, and the Central Prison of Fribourg (Wiedmer 2011). In mid-2011, the Tribune de Genève reported (“Prison administrative cherche terrain à Meyrin,” 4 August 2011) that cantonal authorities in Geneva were considering building a new administrative detention facility near the airport due to space limitation at Frambois, which can hold no more than 20 people. Several weeks later, on 1 September 2011, the Geneva parliament adopted a motion in favour of the construction of 250 additional detention places in the canton. “The motion proposes installing containers at the end of the airport runway or in a nearby industrial area” (24 heures 2011). Criminal and Administrative Segregation. In 2007, the European Committee for the Prevention of Torture criticised Switzerland for failing to segregate criminal and administrative detainees in Swiss prisons. Since then, however, Switzerland has appeared to implement segregation standards (CPT 2008; Kakpo 2011). Red Cross. According to one of the authors of the 2011 University of Geneva publication Evaluation du project-pilote Détention: Enjeux, instruments et impacts de l’intervention de la Croix-Rouge Suisse dans les centres de détention administrative, the Swiss Red Cross plays an increasingly significant role in the processing of migrants in many of Switzerland’s immigration detention facilities. The Red Cross works closely with the Federal Office for Migration and provides “social accompaniment” to detained migrants as they prepare for deportation. The organisation, which has formal agreements with individual cantons, is generally permitted to visit the facilities once a week (Kakpo 2011). According to this researcher, the Red Cross has been brought in by the Federal Office for Migration in order to “burden-share” the “humanitarian” implementation of a strict deportation regime, including making sure Switzerland abides by all relevant international human rights laws, in addition to accelerating the deportation process by working to facilitate foreign nationals to return to their countries of origin (Kakpo 2011). The report Evaluation du project-pilote Détention assessed the Red Cross’ “project Detention,” which aims to provide support to asylum seekers who have had their requests for asylum refused and are awaiting deportation. As part of the study, the researchers analyzed the climate in Swiss administrative detention centres and the impact that the Red Cross has had on this climate; the costs of detention; whether the Red Cross’ role reduces the number of days of detention and associated costs; and whether detention reduces the costs of deportation (Kakpo et al. 2011, p.91). The report, which assessed the situation in five Swiss removal centres that engage the Red Cross (Zurich, Fribourg, Witzwil, Berne-city, and Basel), concluded that the Red Cross contributes to a safer detention experience because the organisation can enable migrants to access rights that are guaranteed under international law, such as healthcare, access to public authorities, and proper treatment (Kakpo et al. 2011, p.92). It also concluded that by helping share the burden of tasks confronting prison wardens, the Red Cross “reduces the everyday stress of guards working with detainees. At the same time, when detainees’ expectations with respect to the [Red Cross] services are not fulfilled, tensions between detainees and the prison staff increase” (Kakpo et al. 2011, p.92). The report claims that its overall findings “strongly suggest” that the Red Cross contributes to decreasing costs of detention and deportation by facilitating the bureaucratic process related to deportation, reasserting the official decision to deport, and offering an emergency fund to migrants (Kakpo et al. 2011, p.92). Conditions at detention centres. The conditions in detention can vary greatly from canton to canton. The European Committee for the Prevention of Torture visited the detention centres for immigrants in Granges and Frambois in 2007. The conditions at the Grange detention centre were found to be satisfactory, albeit with a carceral regime where detainees spent the majority of the day confined to their cells (CPT 2008). Some of the detainees at the Grange facility were found to have been detained without official detention orders being transmitted to facility authorities. The conditions in Frambois were found to be much better, both materially and in relation to the freedom of movement and flexibility of daily regime within the facility. The Frambois facility included a common room where detainees could spend the day and operated an “open door” policy within the facility (CPT 2008). The Swiss National Commission for the Prevention of Torture (CNPT), created in 2010 with a mandate to visit all sites of detention in Switzerland in accordance with provisions in the Optional Protocol to the UN Convention against Torture, has also issued reports on Swiss immigration detention facilities (CNPT 2011a). These reports, which can be found on the CNPT’s website, critique detention operations and provide recommendations to cantonal authorities (CNPT 2011a). In June 2011, the CNPT published a report on its December 2010 visit to the Zurich Airport Prison, which is a criminal incarceration facility that has a section for administrative immigration-related detention. The CNPT found that the way in which detention is organised for the expulsion and deportation of migrants is neither appropriate nor proportionate for most detainees, in part due to its high-security regime. It recommended modifying detention practices in order to provide detainees greater freedom of movement and a more relaxed security environment (CNPT 2011b). Following the CNPT’s report to Zurich authorities, the canton announced plans to establish a new detention centre that would be used exclusively for migrants awaiting deportation (CNPT 2011b). Zurich Airport Prison (not to be confused with the Zurich airport transit zone detention facility) has a separate section for migrants awaiting deportation containing 106 places (Kakpo et al. 2011, p.96). It is reportedly nearly always close to capacity (Zopfi 2011b). The prison offers detainees the opportunity to work for remuneration while in detention. Detainees have no access to outdoor areas (Kakpo et al. 2011, p.96). During its December 2010 visit to this facility, the CNPT found that facility staff conduct themselves properly and in a respectful manner towards detainees. In view of the complex mandate of the facility, it recommended an increase in staff responsible for supervision. It also found that the way in which detention is organised for the expulsion and deportation of migrants is neither appropriate nor proportionate for most detainees, due to the high security prison infrastructure. The CNPT therefore recommended the provision of infrastructure that affords detainees awaiting deportation greater freedom of movement and more relaxed security measures (CNPT 2011b). Basel City Deportation Prison (Ausschaffungsgefängnis Basel-Stadt, Basel) is a dedicated facility for male migrants awaiting deportation. It has a total capacity to hold 60 people. Migrants detained there have access to outdoor spaces and the possibility to work for remuneration while in detention (Kakpo et al. 2011, p.97). Basel City Remand Centre (Untersuchungsgefängnis Basel-Stadt) is a women’s prison that has a separate section (of four places) for migrants awaiting deportation. Detainees at this facility have the opportunity to work for remuneration (Kakpo et al. 2011, p.97). Fribourg Central Prison (Prison centrale de Fribourg) has a separate section for migrants awaiting deportation. It has a capacity to hold 74 inmates, with nine spaces reserved for the detention of migrants awaiting deportation. Detainees have access to an outdoor area and have the possibility to work for remuneration (Kakpo et al. 2011, p.96). Cantonal migration authorities operate the facility and police officers provide security (Kakpo 2011). Witzwil Penitentiary (Anstalten Witzwil) is a prison in Bern that has a separate section for migrants awaiting deportation. It is considered to have one of the more liberal regimes for detainees in Switzerland. The facility has a total capacity of 184, with 36 places reserved for the detention of migrants awaiting deportation (Kakpo et al. 2011, p.98). Transit zone detention facilities. Swiss transit zone detention facilities (or “extra-territorial prisons,” as characterized by Gruppe augenauf) are used to hold migrants who arrive at the border without valid entry documents as well as people who claim asylum upon arrival. According to the Federal Office for Migration, there are two such facilities in Switzerland—the Geneva Airport Transit Zone and the Zurich Airport Transit Zone (OFM, “Aperçu: centres d'enregistrement et de procedure”). The Federal Office for Migration is responsible for asylum seekers detained in transit zones (Swissinfo 2009). According to the NGO Gruppe augenauf, in addition to these two sites, each official border crossing into Switzerland could potentially have a space to briefly confine foreign nationals attempting to enter into Switzerland in an irregular fashion, although no studies have apparently been undertaken that identify these (Zopfi 2011a). Foreign nationals refused entry to the country can be detained in border “transit zones” (zone de transit) for up to 15 days in order to facilitate preparations for their departure (Federal Law on Foreigners Art. 65). Additionally, the Asylum Act (Article 22) provides for detention of asylum seekers for up to 60 days at airports. According to Gruppe augenauf, people held in these facilities can sometimes be treated as if they have not entered Swiss territory. Generally, people who request asylum upon arrival at the airport are placed in a fast-track process to determine whether they are eligible to enter asylum procedures in Switzerland. If they are issued a negative decision, authorities attempt to deport them as soon as possible. Those allowed to enter asylum procedures are officially admitted into the country and placed in one of five semi-secure centres for asylum seekers (see below) (Zopfi 2011b). The Geneva transit facility can reportedly accommodate 33 people—20 beds for men, 10 for women, and a room for minors or couples (Swissinfo 2009). TheElisa association provides legal aid to asylum seekers detained at the Geneva airport. The current facility opened in May 2009 when Switzerland joined the Schengen zone. It replaced another facility that had been located in the basement of a civil protection building at the airport and which had drawn criticism from rights groups and the UN High Commissioner for Refugees (UNHCR) for its lack of natural light, poor food, and limited access to fresh air (Swissinfo 2009). Reception and Registration Center Vallorbe (Vaud). These facilities, which were the subject of an award-winning 2008 documentary called “La Forteresse” by the Swiss filmmaker Fernand Melgar, generally house asylum seekers for anywhere from two weeks to 40 days to verify their identities, undergo health checks, and complete initial administrative procedures.5 They are then released and generally provided non-secure accommodation in an assigned canton (Zopfi 2011b). Asylum seeker reception centres in many European countries appear to operate more as secure detention centres than as “open” facilities. This seems to be partly the case with the Swiss CEPs, which the Global Detention Project characterizes as “semi-secure.” A semi-secure status generally signifies that while a facility provides a minimum level of freedom of movement, it nevertheless employs some form of physical restraint to prevent people from leaving the facility at will, either for a certain portion of the population residing at the facility and/or for certain periods of time. The GDP coding decision was based on a number of factors, including the prison-like appearance of the CEPs. The “La Forteresse” website, for instance, describes the reception centre in Vallorbe, which was formerly a luxury hotel, as “an imposing building riddled with cameras and high barbed wire fences. Only authorized personnel (asylum seekers, cleaning and security staff and delivery people, etc…) can enter this secured zone. Security guards control the opening of the gate that gives on to the courtyard. For an observer used to his personal freedoms, it is difficult not to think of this place as a prison” (La Forteresse, “A Place Forbidden to the Public”). In 2007, the European Network for Asylum Reception Organisations (ENERO) reported that asylum seekers residing at these centres are permitted to leave the facilities under certain conditions and during certain hours of the day (ENERO 2007, p.16-17). Additionally, an asylum seeker who spoke with one GDP researcher said that he had been physically prevented from leaving the Vallorbe facility during a certain period of his stay there. The Lausanne-based group SAJE characterizes the security regime at registration centres as “semi-carceral.” A representative of the group told the Global Detention Project that people housed at these facilities generally are allowed to leave and re-enter them during a few hours in the morning and in the afternoon. Outside those hours, the facility is under lock-down and no one can leave except in special circumstances (Bregnard-Ecoffey 2011). The federal government contracts private companies to help administer these facilities (ENERO 2007, p.5). According to the “La Forteresse” website, “Each CEP is divided into two almost impenetrable sections: A section for the administration and a section for housing 200 to 300 people. The first section answers directly to the Federal Office for Migration (ODM) and handles the management of the centre as well as the complete asylum procedure. To manage the other section for housing, the ODM has hired two private companies that handle the assistance and the security for the centre. ORS Service AG, a private corporation, administers all in-house living requirements, including food, clothing, pocket money, living supplies, small medical treatments, and initial health interviews (ENERO 2007, p.5; ORS Service AG website). According to “La Forteresse,” ORS Service AG, which is based in Zurich, took over these responsibilities in several centres, including those in Fribourg and Soleure, that had previously been run by Caritas and the Red Cross (La Forteresse, “A Place Forbidden to the Public”). Securitas AG, a private Swiss security company, provides security (ENERO 2007, p.6). ASCOM AG, a private network-based security and information service provider, operates the Swiss Automated Fingerprint Identification System for the Swiss Federal Department of Justice and Police, including at the reception centres (ENERO 2007, p.6). Short-term Swiss prisons. According to Gruppe augenauf, Switzerland’s short-term prisons (lower security prisons that are generally used to hold persons convicted for lighter crimes and for shorter periods) are used to confine non-citizens who have been sentenced to prison terms (of three to six months) for illegally residing in the country (Zopfi 2011b). These facilities are operated at the cantonal level. Gruppe augenauf told the Global Detention Project that prison sentences for irregular stay in the country are generally imposed. The first time a migrant is apprehended for irregular entry, stay or exit to/in/from the country he/she is generally sentenced with a three-month probationary sentence and ordered to leave the country. The second time a person is apprehended on these charges, he/she is imprisoned for three months and must also serve the three months previously sentenced on probation (i.e. they are imprisoned for six months). This can be repeated each time an undocumented migrant is apprehended for irregular stay in the country (Zopfi 2011b). 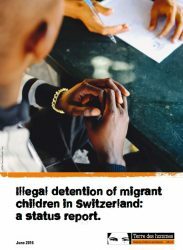 Switzerland operates 27 secure facilities for the administrative detention of foreign nationals: two transit zone detention facilities; five dedicated deportation facilities; 17 prisons with separate sections for the detention of migrants awaiting deportation; and three police stations used for short to medium term detention. It also operates five semi-secure centres for asylum seekers. According to the Federal Department of Justice and Police (DFJP), there are a total of 476 places set aside for the administrative detention of migrants in Switzerland, including in prisons and dedicated deportation facilities (DFJP 2011, p. 25). The DFJP provides a breakdown of these places by canton in Annexe 5 of their report, Rapport sur des mesures d’accélération dans le domaine de l’asile. However, the department does not provide a breakdown by facility. In addition, most of Switzerland’s short-term prisons are used for the incarceration of migrants carrying out prison sentences for status-related criminal convictions (Zopfi 2011). In 2009, there were 12,537 convictions for violations of the Federal Law on Foreigners. However, the Swiss Statistical Office does not provide a breakdown of the statutes in the foreigners law that were the bases for these convictions, thereby making it impossible to know which ones were status related (Ducommun 2011). According to the Federal Department of Justice and Police, between 1 January 2008 and 30 June 2010 a total of 7,136 detention orders were issued to foreign nationals based on their status. Of these, 6,804 (95 percent) were related to detention pending deportation or expulsion and 132 were cases of “preparatory detention”; 200 were detention orders relating to insubordination (DFJP 2011, p. 24-25). The average length of detention pending removal or deportation during this period was 24 days. The average length of detention on grounds of insubordination was 155 days; and 31 days for foreign nationals in preparatory detention (DFJP 2011, Annexe 4). The majority of migrants in detention pending deportation or expulsion between January 2008 and June 2010 originated from the following countries: Nigeria (892); Kosovo (615); Serbia (418); Brazil (310); and Georgia (284) (DFJP 2011, Annexe 4). In 2010, 5.4 percent of those detained in view of expulsion were women (of 371 foreign nationals) (Swiss Federal Statistical Office 2011a). In 2010, a prison-inmate survey revealed that 71.6 percent of inmates were foreign nationals (Swiss Federal Statistical Office 2011b). One immigration expert estimates that as of 2009 there were between 100,000 and 200,000 undocumented migrants (“sans-papiers”) in Switzerland (Smith 2009). Switzerland can receive more than a thousand asylum claims per month. Just under 1,500 claims were lodged in April 2011, compared with 1,874 in March. Most claims in April 2011 were received from citizens of Eritrea, who lodged 376 claims, followed by Tunisians (165), Macedonians (127), and Nigerians (97) (swissinfo.ch 2011b). At the end of 2010 there were 12,196 asylum seekers with pending applications in Switzerland (UNHCR 2011). At the end of 2009 there were 7,139 pending applications (UNHCR 2010). Nigerians represent the largest national group of asylum seekers in Switzerland, with 1,969 asylum applicants in 2010; 1,670 of these requests were rejected (swissinfo.ch 2011a). 24 heures. 2011. “Genève: des policiers supplémentaires vont patrouiller dans les rues.” 24 heures. 1 September 2011. Achermann, Christin & Clément de Senarclens (University of Neuchâtel). 2011. “’Coercive measures’ in Swiss Foreign Nationals Act: justifying exclusion by mixing migration and insecurity?” Paper prepared for the Workshop “Europeanization of Exclusion Policies and Practices”, University of Neuchâtel, 16-17 June 2011. Achermann, Christin (University of Neuchâtel). 2011. Email correspondence with Michael Flynn (Global Detention Project). 7 October 2011. Geneva, Switzerland. Amnesty International. 2001. Switzerland: Death during forcible deportation: an exchange of correspondence following the death of Samson Chukwu. Amnesty International. AI Index: EUR 43/005/2001. May 2001. Amnesty International. 2010. Amnesty International Report 2010: State of the World's Human Rights. Amnesty International. May 2010. Avet, Marie (Swiss Federal Office for Migration). Email message to Cecilia Cannon (Global Detention Project). 8 June 2011. Geneva, Switzerland. BBC News. 2010. “Swiss voters back expulsion of foreign criminals.” BBC News. 28 November 2010. Beetschen, Claude (Etat de Geneve). Email correspondence with Claudie Fioroni (Global Detention Project). 11 May 2009. Geneva, Switzerland. Bregnard Ecoffey, Chloé (Service d'aide Juridique aux Exiles). 2011.Phone conversation with Michael Flynn (Global Detention Project). 23 August 2011. Geneva, Switzerland. Bruderer, Rolf (Head of asylum, Department of Justice and Security, Migration, Canton Thurgau). Email message to Michael Flynn (Global Detention Project). 28 June 2011. Geneva, Switzerland. Burnand, Frédéric. 2010. “Will deportation vote lead to EU tension?”swissinfo.ch. 7 November 2010. Conférence latine des Chefs des Départements de justice et police (CLDJP). Undated website. “Le contexte du concordat LMC.”http://www.cldjp.ch/concordats/contexte_lmc.html (accessed 21 June 2011). Conférence latine des Chefs des Départements de justice et police (CLDJP). 2004. “Etablissement concordataire de détention administrative LMC de Frambois, à Vernier, dans le canton de Genève.” 8 April 2004.http://www.cldjp.ch/concordats/etabl__de_frambois.html. Conseil fédéral. 2009. Application et effet des mesures de contrainte en matière de droit des étrangers : Rapport du Conseil fédéral sur la mise en oeuvre des recommandations de la Commission de gestion du Conseil national (Rapport du 24 août 2005 sur l’application et l’effet des mesures de contrainte en matière de droit des étrangers) du 24 juin 2009. Bern. Contrôle parlementaire de l'administration. 2005. Evaluation des mesures de contrainte en matière de droit des étrangers: Rapport final du Contrôle parlementaire de l’administration à l’attention de la Commission de gestion du Conseil national. Berne. De Maria, Alessandro. (Department of Justice, Canton Ticino). Email message to Michael Flynn (Global Detention Project). 5 July 2011. Geneva, Switzerland. Diem, Roland (Department of Security and Justice, Migration Office, Canton Appenzell Ausserrhoden). Email message to Michael Flynn (Global Detention Project). 28 June 2011. Geneva, Switzerland. Ducommun, Steve Vaucher (Collaborateur scientifique, Office fédéral de la statistique). 2011. Email communication to Cecilia Cannon (Global Detention Project). 14 June 2011. Geneva, Switzerland. Ducrest, Bernard (Chef de service Asile et Aide au Départ, Département de la sécurité, de la police et de l’environnement – Office cantonal de la population, Service étrangers et confédérés). Email message to Michael Flynn (Global Detention Project). 19 August 2011. Geneva, Switzerland. Dürst, Erich (Service de la Population, Canton Vaud). Email message to Michael Flynn (Global Detention Project). 28 June 2011. Geneva, Switzerland. Etablissement concordataire de détention administrative LMC de Frambois, à Vernier, dans le canton de Genève (Le Contexte du concordat LMC). La Conference Latine des Chefs des Departements de Justice et Police. Règlement de Frambois. 8 April 2004. European Committee on the Prevention of Torture (CPT). 2008. “Observations preliminaries formulées par la délégation du Comité européen pour la prevention de la torture et des peines ou traitements inhumains ou dégradants (CPT) à l’issue de sa visite en Suisse du 24 septembre au 5 octobre 2007.” Strasbourg. CPT/Inf (2008) 1. 7 January 2008. European Network of Asylum Reception Organisations (ENERO). 2007. “Report of exchange programme in Switzerland.” ENARO exchange programme to Switzerland, October 2007, H. Jorgensen & K. Loeng. Fahrni, Ruedi (Head of Asylum Seekers, Office for Migration, Canton Schwyz). Email message to Michael Flynn (Global Detention Project). 29 July 2011. Geneva, Switzerland. Federal Department of Justice and Police (DFJP). 2011. Rapport sur des mesures d’accélération dans le domaine de l’asile. Swiss Confederation. March 2011. Gasser, Josef (Abteilungsleiter, Vokswirtschaftsdepartement Obwalden, Amt für Arbeit, Abteilung Migration, Canton Obwalden). Email message to Michael Flynn (Global Detention Project). 5 July 2011. Geneva, Switzerland. Greber, Linda (Office for Migration and Home Affairs, Canton Aargau). Email message to Michael Flynn (Global Detention Project). 7 July 2011. Geneva, Switzerland. Haltiner, Nadine. 2011. “La police fait usage de la violence lors d’un renvoi force au Nigeria.” Tribune de Geneve. 9 July 2011. Human Rights Watch (HRW). 2006. “Switzerland: Vote to Follow Basic Principles of Refugee Protection.” Human Rights Watch. 22 September 2006. Kakpo, Nathalie (University of Geneva). 2011. Interview with Cecilia Cannon (Global Detention Project). 23 May 2011. Geneva, Switzerland. Kakpo, Nathalie (University of Geneva). 2011b. Email message to Cecilia Cannon (Global Detention Project). 5 October 2011. Geneva, Switzerland. Kakpo, Nathalie, Laure Kaeser et Sandro Cattacin. 2011. Evaluation du projet-pilote Detention : Enjeux, instruments et impacts de l’intervention de la Croix-Rouge Suisse dans les centres de détention administrative. University of Geneva, Department of Sociology. Loi fédeérale sur les étrangers. (LEtr). 16 December 2005, (etat 1er Janvier 2009). Federal Assembly of the Swiss Confederation. Loi sur l’asile (Asylum Law). 26 June 1998 (etat 1er Avril 2011). Federal Assembly of the Swiss Confederation. Goumaz, Magalie. 2011. “Malgré la pétition, la fermeture des centres de détention est peu probable.” Le Matin. 8 October 2011. Menzi, Max (Head, Justice and Security Department Basel-City Population and Migration Services, Canton Basel-Stadt). Email message to Michael Flynn (Global Detention Project). 12 July 2011. Geneva, Switzerland. Meyer, Beat (Office for Migration, Canton Basel- Stadt). Email message to Michael Flynn (Global Detention Project). 27 June 2011. Geneva, Switzerland. Modoux, François. 2011. A la racine du malaise autour de «Vol spécial». Le Temps. 7 October 2011. National Commission for the Prevention of Torture (CNPT). 2011a. “La Commission nationale de prevention de la torture publie ses premiers rapports de visite.” CNPT. Press release (Communiqués). 11 January 2011.http://www.nkvf.admin.ch/content/nkvf/fr/home/dokumentation/medienmitteilungen/2011/2011-01-11.html (accessed 6 September 2011). National Commission for the Prevention of Torture (CNPT). 2011b. “La CNPT publie un rapport sur sa visite dans des lieux de privation de liberté du canton de Zurich.” CNPT. Press release (Communiqués). 21 June 2011.http://www.nkvf.admin.ch/content/nkvf/fr/home/dokumentation/medienmitteilungen/2011/2011-06-21.html (accessed 6 September 2011). Ordonnance 1 sur l’asile relative à la procedure. du 11 août 1999 (Etat le 1er janvier 2011). Conseil federal. http://www.admin.ch/ch/f/rs/1/142.311.fr.pdf. Organization for Economic Cooperation and Development (OECD). 2008.OECD Factbook 2010. http://www.oecd-ilibrary.org/economics/oecd-factbook_18147364. Peter, René (Office for Migration, Canton Zug). Email message to Michael Flynn (Global Detention Project). 18 July 2011. Geneva, Switzerland. Ponzetto, Sandrine (Team leader for eviction, Canton St. Gallen). Email message to Michael Flynn (Global Detention Project). 11 July 2011. Geneva, Switzerland. Regli, Andreas (Head of department of asylum and repatriation, Migration Office of the Canton of Lucerne). Email message to Michael Flynn (Global Detention Project). 28 June 2011. Geneva, Switzerland. Rendl, Renata (Canton Schaffhausen). Email message to Michael Flynn (Global Detention Project). Geneva, Switzerland. 28 June 2011. Rickenbacher, Thomas (Verwaltungspolizei, Kanton Appenzell Innerrhoden). Email message to Michael Flynn (Global Detention Project). 1 July 2011. Geneva, Switzerland. Rieben, Charles (Migration and Swiss Permits, Asylum and Return, Canton of Solothurn). Email message to Michael Flynn (Global Detention Project). 25 July 2011. Geneva, Switzerland. Smith, Ray. 2009. “Switzerland: Undocumented Migrants Run Their Own School.” Ipsnews.net. 13 October 2009. www.ipsnews.net/news.asp?idnews=48829 (accessed 30 November 2009). Steinberg, Jonathan. 1996. Why Switzerland? Cambridge University Press. 1996. Swissinfo.ch. 2009. “Life in transit.” Swissinfo.ch.http://www.swissinfo.ch/eng/Home/Archive/Life_in_transit.html?cid=662690(accessed 20 June 2011). Swissinfo.ch. 2011a. “Switzerland and Nigeria to cooperate on migration.” Swissinfo.ch. 14 February 2011. Swissinfo.ch. 2011b. “Asylum seekers bunk down in emergency shelters.” Swissinfo.ch. 5 May 2011.http://www.swissinfo.ch/eng/politics/foreign_affairs/Asylum_seekers_bunk_down_in_emergency_shelters.html?cid=30162214 (accessed 9 May 2011). Swiss Confederation News. 2011. « La Fédération des Églises protestantes de Suisse chargée du contrôle des renvois prévu dans la législation sur les étrangers. » www.newsadmin.chhttp://www.news.admin.ch/message/index.html?lang=fr&msg-id=39618(accessed 21 June 2011). Swiss NGO coalition for the UPR. 2008. “Swiss NGO coalition for the UPR: list of recommendations.” 8 May 2008. http://www.fidh.org/-Switzerland- (accessed 2 May 2011). Swiss Federal Statistical Office. Website a. “Catalogue des établissements de privation de liberté.” Page last updated 16 September 2008. http://www.portal-stat.admin.ch/prison/files/fr/00.xml (accessed 9 May 2011). Swiss Federal Statistical Office. 2011a. “Swiss Statistics – Detention in view of expulsion.” Copyright Federal Statistical Office, Neuchâtel 2011.http://www.bfs.admin.ch/bfs/portal/en/index/themen/19/03/05key/ausschaffungs.html (accessed 9 May 2011). Swiss Federal Statistical Office. 2011b. “Prisons, detention – Key figures.” Copyright Federal Statistical Office, Neuchâtel 2011.http://www.bfs.admin.ch/bfs/portal/en/index/themen/19/03/05/key/ueberblick/wichtigsten_zahlen.html (accessed 9 May 2011). Swiss Refugee Council (OSAR) and Forum réfugiés. 2010. Dublin II: National asylum procedure in Switzerland. Swiss Refugee Council (OSAR) and Forum réfugiés. United Nations High Commissioner for Refugees (UNHCR). 2011. UNHCR Global Trends 2010. UNHCR. 2011. United Nations High Commissioner for Refugees (UNHCR). 2010. 2009 Global Trends: Refugees, Asylum-seekers, Returnees, Internally Displaced and Stateless Persons. UNHCR. 15 June 2010. UNHCR. 2005. “Switzerland: UNHCR deeply regrets adoption of new asylum law.” UNHCR Briefing Notes. 18 March 2005. UNHCR. 2004. “UNHCR raises concerns about proposed revisions of Swiss asylum law.” UNHCR press release. 27 July 2004. Varesano, Orlane (Ligue Suisse des Droit de l'Homme). 2011. Telephone interview with Cecilia Cannon (Global Detention Project). 27 May 2011. Geneva, Switzerland. Wichmann, Nicole, Christin Achermann, and Denise Efionayi-Mäder Wegweisen. 2010. “Ausschaffen. Ein Grundlagenbericht zu den ausländerrechtlichen Folgen der Straffälligkeit.” Bern: Eidgenössische Kommission für Migrationsfragen EKM. 2010.http://www.ekm.admin.ch/de/dokumentation/doku/mat_wegweisen.pdf. Wicker, Hans-Rudolf. 2010. “Deportation at the Limits of ‘Tolerance’: The Juridical, Institutional, and Social Construction of ‘Illegality’ in Switzerland.” In Nicholas de Genova and Nathalie Peutz, eds., The Deportation Regime. Duke University Press. 2011. Wiedmer, Thierry (Chef de l’office du séjour & de l’établissement, Département de l’économie, Service des Migrations, canton Neuchâtel). 2011. Email communication with Michael Flynn (Global Detention Project). Geneva, Switzerland. 23 June 2011. Wuethrich, Susi (Department of Corrections, Canton Glarus). Email message to Michael Flynn (Global Detention Project). 11 June 2011. Geneva, Switzerland. Zopfi, Rolf (Gruppe augenauf, Zurich). 2011a. Email message sent to Cecilia Cannon (Global Detention Project). 9 May 2011. Geneva, Switzerland. Zopfi, Rolf (Gruppe augenauf, Zurich). 2011b. Telephone interview with Cecilia Cannon (Global Detention Project). 9 May 2011. Geneva, Switzerland. Zopfi, Rolf (Gruppe augenauf, Zurich). 2011c. Email message sent to Cecilia Cannon (Global Detention Project). 6 July 2011. Geneva, Switzerland. Zopfi, Rolf (Gruppe augenauf, Zurich). 2011d. Email message sent to Cecilia Cannon (Global Detention Project). 29 September 2011. Geneva, Switzerland. Zünd, Andreas (2007). "Von den alten zu den neuen Zwangsmassnahmen", in Achermann, Alberto et al. (eds.) Jahrbuch für Migrationsrecht 2006/2007. Bern: Stämpfli, p. 97-105. Zwyssig, Patrik (Migration Department, Office of Labour and Migration, Canton Uri). Email message to Michael Flynn (Global Detention Project). 6 July 2011. Geneva, Switzerland. Philippe Feliser (State Secretariat for Migration), Email to Michael Flynn (Global Detention Project), 8 October 2015. Feliser, Philippe (Federal Office for Migration). 2013. Response to Global Detention Project/Access Info Questionnaire. 9 and 24 October 2013. Philippe Feliser (State Secretariat for Migration), Email to Michael Flynn (Global Detention Project), 25 September 2015. Federal Act on Foreign Nationals. 16 December 2005. https://www.admin.ch/opc/en/classified-compilation/20020232/index.html. article 65. Asylum Act. 26 June 1998. https://www.admin.ch/opc/en/classified-compilation/19995092/index.html. article 22. Federal Act on Foreign Nationals. 16 December 2005. https://www.admin.ch/opc/en/classified-compilation/20020232/index.html. article 77. Federal Act on Foreign Nationals. 16 December 2005. https://www.admin.ch/opc/en/classified-compilation/20020232/index.html. article 75. Federal Act on Foreign Nationals. 16 December 2005. https://www.admin.ch/opc/en/classified-compilation/20020232/index.html. article 76. Federal Act on Foreign Nationals. 16 December 2005. https://www.admin.ch/opc/en/classified-compilation/20020232/index.html. article 76(a). Federal Act on Foreign Nationals. 16 December 2005. https://www.admin.ch/opc/en/classified-compilation/20020232/index.html. article 115. Federal Act on Foreign Nationals. 16 December 2005. https://www.admin.ch/opc/en/classified-compilation/20020232/index.html. article 79. State Secretariat for Migration. Migration Report 2014. www.bundespublikationen.admin.ch. Federal Act on Foreign Nationals. 16 December 2005. https://www.admin.ch/opc/en/classified-compilation/20020232/index.html. article 80. Federal Act on Foreign Nationals. 16 December 2005. https://www.admin.ch/opc/en/classified-compilation/20020232/index.html. article 81. Federal Act on Foreign Nationals. 16 December 2005. https://www.admin.ch/opc/en/classified-compilation/20020232/index.html. article 67. § 17: The State party should develop and implement alternatives to administrative detention and should use detention only as a last resort, particularly where unaccompanied minors are concerned, and, when detention is necessary and proportionate, for as short a period as possible. The State should continue its efforts to provide special facilities in all cantons in order to accommodate migrants in administrative detention under an appropriate regime. Committee against Torture. Concluding observations on the seventh periodic report of Switzerland. CAT/C/CHE/CO/7. 7 September 2015. http://www.ohchr.org/EN/countries/ENACARegion/Pages/CHIndex.aspx. § 13: The State party should reconsider the maximum period of administrative detention, resort to it only in exceptional circumstances and limit its duration in light of the principle of proportionality. § 17: The State party must also take measures to ensure that minors and adults, as well as detainees serving under different prison regimes, are separated. Finally, it must take steps to ensure the application of legislation and procedures concerning health-care access for all prisoners, especially those with psychiatric problems. Swiss Federal Office for Migration. Website. "Cantonal immigration and labour market authorities." Last updated 1 June 2011. http://www.bfm.admin.ch/content/bfm/en/home/die_oe/kontakt/kantonale_behoerden/adressen_kantone_und.html. (accessed 20 June 2011). Diem, Roland (Department of Security and Justice, Migration Office, Canton Appenzell Ausserrhoden). Email message to Michael Flynn (Global Detention Project). 28 June 2011. Dürst, Erich (Service de la Population, Canton Vaud). Email message to Michael Flynn (Global Detention Project). 28 June 2011. Site officiel de l'Etat de Genève, "Règlement de l'établissement concordataire de détention administrative de Frambois," Site officiel de l'Etat de Genève, http://www.geneve.ch/legislation/rsg/f/s/rsg_F2_12p08.html (accessed August 21, 2007). Wiedmer, Thierry (Migration Service, Canton Neuchâtel). Email message to Michael Flynn (Global Detention Project). 23 June 2011). Meyer, Beat (Office for Migration, Canton Basel- Stadt). Email message to Michael Flynn (Global Detention Project). 27 June 2011). Federal Office for Migration. Website. "Cantonal immigration and labour market authorities." Last updated 1 June 2011. http://www.bfm.admin.ch/content/bfm/en/home/die_oe/kontakt/kantonale_behoerden/adressen_kantone_und.html. (accessed 20 June 2011). Rendl, Renata (Canton Schaffhausen). Email message to Michael Flynn (Global Detention Project). 28 June 2011). Office Fédéral de la statistique. "Domaine 19 - Criminalité, droit pénal Catalogue des établissements de privation de liberté: Etablissements par canton." Last updated 2008. http://www.portal-stat.admin.ch/prison/files/fr/01.xml (accessed 15 June 2011). Rieben, Charles (Migration and Swiss Permits, Asylum and Return, Canton of Solothurn). Email message to Michael Flynn (Global Detention Project). 25 July 2011. Office Fédéral de la statistique. "Domaine 19 - Criminalité, droit pénal Catalogue des établissements de privation de liberté: Etablissements par canton." http://www.portal-stat.admin.ch/prison/files/fr/01.xml (accessed 15 June 2011). Zwyssig, Patrik (Migration Department, Office of Labour and Migration, Canton Uri). Email message to Michael Flynn (Global Detention Project). 6 July 2011). Geneva, Switzerland. Gasser, Josef (Abteilungsleiter, Vokswirtschaftsdepartement Obwalden, Amt für Arbeit, Abteilung Migration, Canton Obwalden). Email message to Micahel Flynn (Global Detention Project). 5 July 2011. Geneva, Switzerland. Graf, Denise (Amnesty International Switzerland). 2015. Email to Michael Flynn (Global Detention Project). 15 February 2015. Office federal de la statistique (Switzerland), "Catalogue des establissements penitentiaires," March 2015. Commission nationale de prévention de la torture (CNPT). Website. http://www.nkvf.admin.ch/nkvf/fr/home.html. Migrant Integration Policy Index. 2011.